RICHMOND – Tea party hero Ken Cuccinelli, the head of the Virginia ACLU and others across the political spectrum called Thursday for an amendment to the state Constitution to protect citizens from unwarranted searches and seizures. They supported a provision similar to the U.S. Constitution’s Fourth Amendment prohibiting unreasonable search and seizure. Advocates of the idea want to extend that protection to electronic devices and information given to a third party, such as a cellphone company or a website. I'm no fan of Cuccinelli, but I'll stand right by his side on this one. Good on him! The entire federal government, including the Supreme Court, has been eroding our fourth amendment rights for the last fifteen years. I've written about this before... many times. Others have fought this fight in their own ways, from Senator Ron Wyden's and Representative Justin Amash's legislative proposals, to the technical evangelism of Bruce Schneier and Jacob Appelbaum, the whistleblowing of Thomas Drake and others, and the shocking revelations of Edward Snowden. This effort is different. If successful, this legislation will pit the people and Constitution of Virginia against the federal acolytes of the national security state. This will be a frontal assault on on the weasel words concocted by NSA lawyers to justify mass surveillance and retention of all our personal information. It will be a punch in the gut of any federal official trying to serve a national security letter on a Virginian. It will tell the rest of the nation that Virginians would rather stand for our freedom than cower for our safety. Is the Virginia General Assembly, the oldest legislative body in the New World, up to this? Will Governor McAuliffe embrace this in the face of the inevitable backlash of the Obama Administration? Are we up for this fight? I intend to do what I can to support this legislation. Writing a few letters is the least I can do if I want to claim the title of Virginian like Washington, Jefferson, Lee and Jackson. "The basic problem is that our policies regarding Iran are not fully aligned. That is a product of many things, including that Israel is closer and more vulnerable to this threat, and has no margin of error. Does it seem odd to anyone else that the former US citizen Ron Dermer is discussing this with Jeffrey Goldberg who either is or was an IDF reservist? No matter, I fully support Goldberg's effort to pry the truth out of Dermer. What Israel seems to want for the rest of the ME is a super-sized Morgenthau Plan that would reduce the surrounding countries to unindustrialized pastoral regions without the potential for manufacturing weapons. At the same time Israel seems to want the US to continue to march in lock step with it on any issue of interest. To that end they wish to address the Congress of the United States for the purpose of lobbying against the president of the US. "Poll: Netanyahu should be investigated for nuclear weapons tech smuggling before US visit "
"Younger respondents (age 18-24 and 25-34) are generally more likely to want Netanyahu investigated (73.6 percent and 62.0 percent) than older Americans. Responses vary little between income categories. However females (63.4 percent) were more likely than males (50.4 percent) to prefer Netanyahu be criminally investigated before being allowed to enter America. "... the jury convicted Sterling based entirely on circumstantial evidence: there was not one shred of evidence showing Sterling handing Risen classified information on the operation, the Russian asset, or the letter that Risen found but FBI could not. The evidence consisted of 57 phone calls between Sterling and Risen (some on their own phones, some on a phone Sterling had access to) between March 2003 and November 2005, the content of which we know nothing. It included a handful of emails, some of which indicate (in 2004, before Risen submitted his book proposal) Risen wanted to continue to talk to Sterling and wanted to send him something. One March 10, 2003 email, which Sterling deleted sometime in 2006, possibly after FBI subpoenaed him in this investigation, showed that Sterling had sent Risen the link to a CNN article claiming Iran had a very advanced nuclear weapons program. “All the more reason to wonder…” Sterling said in the email. The evidence showed that in March 2003, as the Bush Administration started a disastrous war based on claims of a dangerous nuclear program, Sterling used proper legal channels to raise concerns about the operation (citing “current events” to explain the timing of his concern) at the Senate Intelligence Committee. "CSE tracks millions of downloads daily: Snowden documents"
The injection of the political realm into the moral realm degrades both. When matters of moral value are seen through a political lens, what one sees is distorted and contaminated. The moral value is never free of conditional circumstances, but it tries not to be enslaved by them. A moral value shines by its integrity, its repudiation of expedience, its shunning of the half truth because of its allegiance and obedience to accurate fact. Those were my thoughts as I read about the case of former CIA official Jeffrey Sterling who was recently convicted of espionage by a federal court in Alexandria, VA. However, there are things to keep in mind as we consider this case. By the year 2000, Iran had for years obtained expertise from Russia and Chinese nuclear specialists equipped to study any blue prints submitted to Iran by countries eager to help Tehran expand its nuclear program. Iran had for years had obtained from the black-market network of the Pakistani scientist A.Q. Khan, plans for developing nuclear weapons. Until 2003, Iran had a strategic goal in developing such a weapon – it was to be a deterrent, not against Israel, but the nuclear forces of Iraq’s Saddam Hussein. To be plain, Iran certainly was capable of discerning a fake nuclear blueprint from a genuine one. The CIA’s targets at the time were North Korea, Iraq, and Iran. After 9/11, Iran was conspicuously efficient in supporting the U.S. / Northern Alliance against the Taliban, which Iran deeply hated, helping the U.S. to rescue its downed pilots, even giving U.S. forces maps on which Taliban targets were to be bombed. This changed. Under President George Bush, Iran was now a member of “the Axis of Evil.” The earlier smiley face of Iran had been replaced by a harsh face of murder terrorism and exploitation. The designation, “the Axis of Evil," has always had for me the crudity of a cartoon. In addition, it was wrong. Even then, in 2003, Iran was making efforts to hand over to the U.S. top al Qaeda lieutenants, including a son of Osama bin Laden. Since the Clinton years, low level US and Iranian talks had been taking in Vienna. The Counterproliferation Division of the CIA’s Directorate of Operations now came up with what they thought was an ingenious plan. Find a prospect, a Russian that could act as an intermediary, vet him, cross-examine him, and use him to transport nuclear plans to Iran in order to sabotage its program. The highlight of this operation was the insertion of defects into the plans that would be passed on to the Iranians. In other words, the aim of this was to send Iran off on a wild goose chase. A scandal occurred. A CIA official told Jim Risen of The New York Times about the plan, and the pitiless furies of “national security” arguments were unleashed, aimed at proving that Risen was the source of articles about the plan printed in The New York Times. Of course, the burden of proving espionage lies with the government. A government should not be allowed to use mere proximity, tangential conversations or vague-mails to prove espionage. In the Sterling case, such encounters are merely circumstantial. They are not proof. A government may infer that something bad happened, but that is mere supposition. the government didn’t make its case. It had facts on peripheral issues e-mails, et, but there was no one piece of evidence that make clear that Sterling was Risen’s source. Sadly, Sterling was charged with espionage. In making such charges, the burden of proof is always on the government making the charge. In the Sterling trial, The CIA official who allegedly spoke to Risen, Jeffrey Sterling was indicted and for seven years, the federal government brought pitiless pressure on Risen to name Sterling as his source. One principle of journalism is always honored, one ideal is impetrative stands above all the rest – that is, never give up the name of a source, and unless they are dead and their family gives the reporter permission to the name. I have read only news accounts of the case, but one fact strikes one as extremely curious. The Iranians never took the bait. One can infer that the Iranian officials thought the US-manufactured nuclear plans bogus. In spite of the CIA’s plan, the Iranians never stirred a hair. This brings us to the National Intelligence Estimate of 2007. That document said, “We assess with high confidence that until fall 2003, Iranian military entities were working under government direction to develop nuclear weapons. No matter, and never mind. According to news accounts, Sterling was initially charged with committing ten felonies, seven of which fall under the Espionage Act. The other charges were mail fraud and obstruction of justice. The mail fraud charge was dismissed by the judge last week before deliberation. Sterling’s case was the first case involving an alleged leak to the press to proceed to a full trial in thirty years. The last case involved Samuel L. Morison, a Navy civilian analyst who was charged under President Ronald Reagan for leaking photographs of Soviet ships to alert America to what he perceived as a new threat. The conviction of Sterling seems to me to be a vast mistake, the wrong thing done for the wrong reasons. Sterling will remain free on bond until his sentencing, which is scheduled for April 24. His defense is working to “seek to have the verdict thrown out” and, if that does not happen, they will appeal. "... the government failed to produce any proof that Sterling talked with Risen about the Iran operation, Lang and other close observers of his trial have noted. Prosecutors could show only that Risen and Sterling, an African-American, talked and traded emails after an appeals court rejected a race discrimination suit by Sterling against the CIA in 2005. But Lang, a Middle East expert who was the DIA’s first director of the service’s foreign spying program in the 1990s, called the verdict a travesty. Pro-Moscow rebels, backed by what NATO says is the open participation of Russian troops, pressed on with their offensive on Sunday after restarting the war in eastern Ukraine with the first all-out assault since a truce five months ago. U.S. President Barack Obama said Washington was considering all options short of military action to isolate Russia. The European Union called an emergency meeting of foreign ministers of its 28 member states. "We are deeply concerned about the latest break in the ceasefire and the aggression that these separatists -- with Russian backing, Russian equipment, Russian financing, Russian training and Russian troops -- are conducting," Obama told a news conference during a visit to India. "I will look at all additional options that are available to us short of military confrontation and try to address this issue. And we will be in close consultation with our international partners, particularly European partners." That pretty much sums up where the politicians stand now that last September's Minsk Protocol has collapsed so spectacularly. The Prime Minister of the Donetsk Peoples Republic (DNR), Alexandr Zakharchenko emphatically declared that there will be no more ceasefires. What's happening on the ground? It's difficult to know from day to day. Both sides push their own versions of reality. However, I think the photo at the top of this post sums up the current situation on the ground in Novorossiya. At center front, with his fist in the air is Matros, a company commander in the DNR Sparta Battalion. Behind him and two of his soldiers stand a number of Ukrainian prisoners, probably from the 93d Brigade, the “cyborgs” that held part of the airport since last summer. This picture was taken at the airport a few days ago after it was finally captured by the rebels. This video was probably made shortly after the above photo was taken. The words of Matros ring truer than those of any politician... "It's only the beginning." Let's listen to words of some of the men at the heart of this battle to better understand what's going on. In addition to Matros, hear the words of Motorola (Arseny Pavlov) and Givi (Mikail Tolstoy). Motorola is the 32 year old commander of the Sparta Battalion. He served in the Russian naval infantry in the 2nd Chechen War, but was a stone cutter before he joined the fighting last year. Givi commands the Somali Battalion. He served in the Ukrainian Army from 1998 to 2000 as a conscript tanker. After that he worked in a sling rope factory. Neither individual was a professional military man. They fought beside Strelkov at Slaviansk and were instrumental in closing and reducing the Iliovansk cauldron last August. In this 16 January interview with Motorola, he describes how the Ukies launched an attack on his position at the airport and were repulsed before his battalion began the assault on the new terminal. In this 17 January interview Givi describes the airport battles, the importance of suppressive fires and acknowledges the strength of the Ukies and the difficulties of the battles ahead. On 18 January he describes how he repulsed a Ukie attack that attempted to outflank the airport. This is an interview with Givi and Matros in a more relaxed moment on 18 January. Soldier talk. I miss it. What does the future hold? For men like Givi, Motorola and Matros hard battles are ahead. Putin appears to be solidly behind the rebels military offensive since he is keepng the voentorg supplies flowing. This is more important than any political support at the moment. Perhaps most important is whatever training and advisory support Russia is providing. The polite men in green seem to be going a bang up job and they certainly know how to STFU. I have no proof of this, but my experience tells me it is so. I'm envious of their expertise and success. This clearly contrasts with whatever training and advisory program is in place for the Ukrainian Army. How far will Washington and the EU go to support the junta in Kiev? We had Standard and Poor cut Russia's credit rating to junk today. I seriously doubt this move will close the voentorg. If the rebels close and reduce a new cauldron at Debaltsteve, will the Ukrainian conscripts desert and/or defect en masse? Will Pravy Sektor and Svoboda overthrow the current junta in Kiev? Will the US and EU continue to support Kiev in that case? I have a feeling we'll have answers to these questions before General Mud arrives on the steppes of Ukraine. This morning, just before I saw COL Lang's post about American Sniper, I read Matt Taibbi's commentary at Rolling Stone. Taibbi has a very interesting and insightful take into why the movie has been so popular. It relates back to what a lot of people - analysts, commentators, and just informed regular citizens - have identified as a problem in our ongoing experiment in self-government. American Sniper, like the war movies that came out in the years after the Vietnam War, allows Americans off the hook. As a result there is no need for deep politial or ideological self examination. There is also no reason to actually do anything to change the circumstances that allow for poorly conceived and ill advised adventures abroad and the ongoing degradation, at all levels, of self-government at home. "Sniper is a movie whose politics are so ludicrous and idiotic that under normal circumstances it would be beneath criticism. The only thing that forces us to take it seriously is the extraordinary fact that an almost exactly similar worldview consumed the walnut-sized mind of the president who got us into the war in question." In reference to an actual revuew of the movie, Taibii also writes that "Griggs added, in a review that must make Eastwood swell with pride, that the root of the film's success is that "it's about a real person," and "it's a human story, not a political one." Well done, Clint! You made a movie about mass-bloodshed in Iraq that critics pronounced not political! That's as Hollywood as Hollywood gets." "The thing is, it always looks bad when you criticize a soldier for doing what he's told. It's equally dangerous to be seduced by the pathos and drama of the individual solider's experience, because most wars are about something much larger than that, too. They did this after Vietnam, when America spent decades watching movies like Deer Hunter and First Blood and Coming Home about vets struggling to reassimilate after the madness of the jungles. So we came to think of the "tragedy" of Vietnam as something primarily experienced by our guys, and not by the millions of Indochinese we killed. That doesn't mean Vietnam Veterans didn't suffer: they did, often terribly. But making entertainment out of their dilemmas helped Americans turn their eyes from their political choices. The movies used the struggles of soldiers as a kind of human shield protecting us from thinking too much about what we'd done in places like Vietnam and Cambodia and Laos. This is going to start happening now with the War-on-Terror movies. As CNN's Griggs writes, "We're finally ready for a movie about the Iraq War." Meaning: we're ready to be entertained by stories about how hard it was for our guys. And it might have been. But that's not the whole story and never will be. We'll make movies about the Chris Kyles of the world and argue about whether they were heroes or not. Some were, some weren't. But in public relations as in war, it'll be the soldiers taking the bullets, not the suits in the Beltway who blithely sent them into lethal missions they were never supposed to understand." Click on over and read the whole thing! And while you're there, if you haven't already, check out his writing on both the financial crisis and the criminal justice system. Make sure to catch his explanation of how turning the commodity markets into a casino helped to hugely inflate the price of gas. And treat yourself to his book and column reviews of Tom Friedman. WARNING: Do NOT eat or drink anything while reading the reviews of Friedman! I would rather see "Paddington." I don't get it. I don't get the whole "American Sniper" thing. Shooting people with a rifle at extended ranges is something I am familiar with. There is nothing particularly noble about shooting people with a rifle at several hundred yards. It is merely necessary in war. I was not a sniper but I was a notable marksman and I shot men with a rifle at long ranges. I am not ashamed of that. It was war and it needed doing, but I sure as hell don't want anyone to thank me for it. I hesitate to tell you all that because some fool will think I am boasting or looking for sympathy. Neither is true. This SEAL was a sniper by trade. He volunteered for that occupational area and stuck with it for a long time. He is reputed to have shot and killed 150. That is a lot of dead people. I don't understand the whole "confirmed kills" thing. Why on earth would you keep track of that? In the airborne force we kept track of the number of jumps you had made. We had little log books for recording them. that had reason behind it. After "X" number of jumps you received more senior rating as a parachutist. Do people who snipe as a trade receive a "senior sniper badge," and then a "master sniper badge?" I don't get it. And why is the American public so mad for this film? The American people turned their backs on my generation of soldiers. Some of them still think that the army that fought in SE Asia was essentially a criminal enterprise. A neighbor who is an otherwise sensible person told me a while back that "all the good people went to Canada." And now we have this adulation for a man who was an effective, efficient killing machine. I don't get it. “In the course of the Yemen experience, Walt had grown close to his French, Saudi and British colleagues. The insurgent war in the southeast of North Yemen was of great concern to the Saudi government. The notion that left wing guerrillas led by outright communists might defeat the Salih regime and arrive on Saudi Arabia’s southern border was understandably worrying. The Saudi Ministry of Defense called for a US/Saudi meeting in Riyadh. Lang learned of this from the Saudi attaché in Sanaa, but thought little of the matter until the US attaché office in Jeddah sent their twin engine airplane to bring him to the meeting. The night before this “pow-wow,” there was a pre-meeting meeting at MG Jenkins house in his training unit’s residential compound. After dinner, Jenkins tried to brainstorm the coming proceedings. Lang said little until Jenkins off-handedly asked him how long he would speak. The Saudis had told Jenkins that they wanted Lieutenant Colonel Lang to brief. “How long would you want me to speak, general?” was the reply. Lang was an accomplished briefer and public orator. He could make the presentation be whatever length Jenkins required. This answer enraged the air force general. His face grew red and he stammered until they all left. The next day when the Americans arrived at the Saudi conference room they found that Saudi MG Mardini, the head of their overseas military assistance program was presiding. Lang moved to the US side of the table intending to sit as far away from Jenkins as possible. Lang took the indicated seat next to the Saudi military attaché from Sanaa. The man reached over and held Walt’s hand. This was a normal gesture of friendship in Arabia, but the Jenkins’ side of the table squirmed and frowned. When the usual meaningless talk of eternal amity ended, Mardini stated that al-muqaddam Lang would give the Saudi intelligence brief to begin the meeting. Someone explained that the Arabic word meant lieutenant colonel. Jenkins face grew red again. Mardini watched him as a snake watches a bird. “Why?” Jenkins rasped at last. Mardini smiled. He was clearly enjoying this spectacle. “Our attaché in Sanaa, al-muqqadam al-Obeid is not an intelligence man. He is a… political liaison to the tribes south of Sanaa. He learns much of what he knows of the combat situation from his brother antar. Actually, Lieutenant Colonel al-Obeid suggested that antar brief here for us. Mardini, indicated with a languid hand motion that he might begin. Lang spent 30 minutes at the map board, briefing the Yemen insurgency in Arabic. When he finished the Saudi officers asked a few questions. Mardini said, “mumtaz. That means excellent,” he told Jenkins. “I detect a slight Palestinian accent,” he remarked to Lang. At the break, several of Jenkins’ officers followed their boss into the hallway to congratulate Lang. “I did not think you could be as good at this as people said. You are a professional,” Jenkins said and walked away. The Arabs could be heard laughing in the conference room. They were pleased to see Jenkins eat dirt. It was obvious that they detested him. The pattern was set. When Lang returned from the United States as the attaché in Saudi Arabia he knew that Jenkins already hated him. According to The Daily Beast, the CIA's head of The National Clandestine (Intellligence?) Service, has announced he plans to retire after only Two years in that position. According to the report, the catalyst is Director Brennans allleged desire to do away with the divide between analysis and the clandestine (collection?) service in favour of organising into self contained regional groups. To this amateur, such a change introduces the risk of "groupthink" where collection activities are shaped to suit the ruling analytic paradigm and unwanted, perhaps contrary, intelligence that doesn't fit the desired narrative is simply not collected. I wonder if it also might negatively impact the security of clandestine assets. I would like to think that critics of this move within CIA are motivated by a desire to produce "Frank and Fearless" high quality intelligence as opposed to just saving their careers. I hope Col. Lang might like to comment on this situation. Top Spy To Step Down. The continuing phenomenon of US inability to deal with MENA countries on their own terms rather than on the basis of our imagined images of these places is just awful. I wrote an article in FP on-line years ago in which I argued that US illusions about Iraq were the source of of our major difficulties there. “Lang was Defense and Army Attaché (DATT/ARMA) in the Yemen Arab Republic for three years (1979 to 1982). The embassy was small and lodged in a multi- story mud and palm log building in the middle of Sanaa. The ambassador lived there surrounded by beautiful gardens and many servants. Lang and Marguerite established themselves in a rambling white masonry house about a mile from the embassy. It was surrounded by a ten foot wall topped with broken glass. Water was provided by trucks that filled and refilled tanks on the roof. In time Marguerite’s garden rivalled that of the embassy. There was a guard, an aged Yemeni tribal, who although in his eighties had a large and ever growing family. His name was Ahmad. He had every Saturday off and spent it at home somewhere making more babies. He and one of his wives produced a new one during the Langs’ time in Sanaa. When asked by Lang how he managed that he replied, “Clean living, fasting in Ramadan and effort every Saturday.” Ahmad was very solicitous of the memsahib’s welfare and guarded the place like a lion during Lang’s frequent absences in the field. Ahmad lived in a little whitewashed building by the front gate. The office consisted of Lang, his US Army sergeant and a driver who was an employee of the embassy, but in reality was a major in the Yemeni National Police. His assignment was surveillance of the American military attaché. His name was Abdullah al-Shami. He was a substantial person whose help was always generously given when it was requested and sometimes when it was not. He knew that Lang’s work required him to “poke around” the country in places that were frequently unsafe because of banditry or some other sort of local warfare. When Lang needed to go somewhere that was probably insecure he formed the habit of asking Abdullah’s opinion. If the answer was positive, they went there together. If the answer was not, he went alone when Abdullah was away. Abdullah spoke reasonably good English having been a driver for several British officers at Aden when the United Kingdom possessed South Yemen, but Lang asked him when they first met to speak nothing but Arabic to him and he always did. From time to time he gave Lang a verbal report as to what sort of grade his Arabic deserved. Abdullah was a wonderful companion on field trips across the mountain and desert country. On some occasions, parties of tribesmen halted their Land Cruiser truck or Peugeot 504 on country roads to demand tribute or the vehicle. Lang and Abdullah were armed with sub-machine guns in the car and Browning 9 mm. automatic pistols in hidden holsters. These were formidable but Abdullah never waved a firearm at the “bandits.” He always walked back to the car’s trunk and picked up two axe handles. With those in their hands they would approach the offending group. Abdullah then greeted them in a friendly way but if the tribesmen were aggressive he would open his jacket to show his pistol and declare, “oh sons of donkeys, do you want to see blood?” The tribesmen were always taken aback and inevitably settled for canned groceries brought as trade goods. On one occasion Lang fired a magazine from an old M-3 “grease gun” sub-machine gun into a river bank when it was clear that there would be no violence. He had bought the weapon at a local arms bazaar. The strike of the .45 ACP bullets astounded the audience and on an impulse Lang handed the gun to the leader as a gift. The stocky little man in native dress embraced him. As they drove off Abdullah laughed in delight. In the mirror the chieftain could be seen standing by the track holding the weapon above his head. For the rest of his time in Yemen Lang and Abdullah knew they were safe in that little valley. On longer journeys to the south they often “staged’ through there and slept in the village after dining on a sheep or goat they had brought to these people as a token of friendship. Their safety was ensured by the tribal Arab’s duty to offer hospitality and protection to friends. Abdullah’s “cover” as a driver wore thin at times. On the road, policemen sometimes saluted him and addressed him as “major.” When that happened, Lang would pretend to be looking out the window at the barren countryside. Abdullah lived in a small building in the back yard of the Lang’s large house and he, too, went home on the weekends. Pat Lang was not the cookie pushing type of attaché. He was not someone who particularly liked cocktail parties although he attended many. The USSR had a 500 man military mission in N. Yemen and another of similar size in communist South Yemen. This military mission was commanded by a Tank Corps major general who liked Americans. He had been a 17 year old lieutenant in 1945 and had been among the Soviet armored men who had met the US Army at Torgau on the Elbe in Germany. He had never gotten over the experience and when he discovered that Lang was friendly, a useful relationship developed that drove the State Department people in the embassy to lecture Lang to the effect that he should keep his distance so that the Yemenis would not think he found the Soviets acceptable company. He told them that he was there to collect information and the Soviets had the information he needed. The CIA station chief laughed and said that he was quite right. The Communist Chinese also had a very big embassy in Sanaa. It was heavily manned with Middle East trained “spooks” who spoke beautiful Arabic. The Red Chinese also had 2,000 construction workers in North Yemen employed in continuing road projects begun earlier by the US all over the country. They were most helpful in reporting what the Soviets were "up to." There were tribal wars of varying size all over the country. Some were against other tribes. Some were against the government, and some others were in combination with the government against yet other tribes. The variety was endless. To make the ”stew” even richer, there was a coalition of leftist political groups called the National Democratic Front waging a major war against the North Yemen government. This “front” brought together; Communists, Baathists, Socialists, and just plain dissident folks who had a variety of motives. As an example, North Yemeni forces killed several NDF guerrillas who were found to be second generation Americans from Michigan. One of them had a copy of a pamphlet by Tom Paine in a pocket along with his US passport when he died. The year was 1978. The USSR supported both sides in this war between north and south largely because Ali Abdullah Salih, the Yemeni president, displayed great skill in playing the Soviets, the US and the UK off against each other to make sure that happened. Salih, the British MI-6 station commander, and Lang often went hunting together. The British fellow introduced Pat to Salih. The president often laughed aloud with the Western spies and rejoiced at the ease with which their countries were duped. He said he placed the Britisher and Lang in a different category as being people as devious as he and unlikely to be believed if they "ratted’ on him. The United States had a six man military mission in North Yemen and a USAF team busy teaching the Yemen Air Force to fly F-5s fighters that the Saudis had bought for them. Assisting the TAFT was a worthless group of Saudi Air Force Pilots whose specialty seemed to be crashing aircraft and a Taiwanese Air Force group seconded to the Saudi Air force to maintain the F-5s. The US military training groups were confined by directive to execution of training tasks. Lang was not. Jobs always seemed to grow and change to match what he could and wanted to do. He used the Red Chinese to collect against Soviet activities, used the British embassy to collect against tribal activities and the French embassy for collection against the internal activities of the Salih government. French intelligence had two of Salih’s ministers on their payroll. Lang was an experienced case officer and had a secondary task in Yemen of assisting CIA in recruiting from the diplomatic community. To that end and for his own reporting to DIA, he cultivated the Soviet intelligence people from the GRU and KGB in their embassy as well as the Soviet military mission in general. Many of these came to the house for; cookouts, sit down dinners, movies, card games and the like. At a steak and shrimp grill party one night, the Soviet general asked if he would like to accompany a counter-guerrilla operation conducted by 8th Yemeni Commando Brigade. He said he reckoned Lang was better at this than his own men. They had been assigned from the 106th Soviet Airborne Division and that he was sure Lang knew more Arabic than they. He had a KGB minder with him that night and the man’s wife held her sides laughing while the spook husband choked on his steak. The general laughed as well and said to ignore him. Lang asked DIA and was given permission. This trip to the field was often repeated and developed over time into a relationship with the Soviet commando advisers in which “Westerners” supposedly banded together against the wily NDF. After a while Lang wore Yemeni uniform in the field as did the Soviets. The Soviet advisers with this outfit were almost all non-Russians. They were Azeris, Armenians, Georgians, Chechens, etc. Their home division’s permanent station was in the Trans-Caucasus Military District. Lang could talk to the Yemenis on these expeditions and the Soviets could not. The commando brigade made use of the American built F-5s as well as various Soviet provided jets for close air support on the laurel covered mountainsides in the southeast. They also had armed MI-8 helicopters in support of operations. The Yemeni pilots were dangerous to their own soldiers as well as to the targets, and it was soon agreed that Lang would vector the air support onto the targets supposedly because he had much experience in this. The 8th Commando Brigade killed many NDF fighters and lost a good many men as well. Yemenis are real fighters no matter what side they are on. Lang’s US general officer boss came to visit. Ironically, The Red Chinese ambassador told the man that Pat Lang was a hero of the struggle against Soviet hegemonic ambitions and those of the running dog friends of the Soviets as well. Pat supposed the Chinese ambassador did not know how much Lang had managed to embed himself in the Soviet advisory effort. It will be interesting to learn how many of you believe this story. Boehner should read the constitution and the law. "... the president also directs U.S. foreign policy. Through the Department of State and the Department of Defense, the president is responsible for the protection of Americans abroad and of foreign nationals in the United States. The president decides whether to recognize new nations and new governments, and negotiates treaties with other nations, which become binding on the United States when approved by two-thirds vote of the Senate. Clearly it is within the legal powers of the president of the US to grant or deny a visa to enter and/or reside in the US to foreign persons who apply for such a visa. It is not within the power of any member of the Congress of the United States to grant a visa to enter to enter the United States. IMO it is entirely inappropriate for the Speaker of the House of Representatives to seek to bring a foreign head of government to the US for the purpose of undermining the constitutional foreign policy authority of the presidency. "... the plane was subject to extraordinary forces from the weather. AirAsia chief executive Tony Fernandes said earlier this week that preliminary investigations suggested the jet encountered "very unique" weather on its flight last Sunday morning from Surabaya to Singapore. Mr Soejatman, a respected analyst in Indonesia, said the extremity of the forces on the plane meant the "black box" flight recorder would be of less use in explaining what happened than forensic examination of the pieces of wreckage currently lying in about 50m of water in the Karimata Strait between Borneo and the Belitung Islands off Sumatra. My relatively uneducated guess based on experience and training as a light plane pilot long ago is that this captain ran into the mother of all up-drafts and was thrown far higher than he wanted to be at speeds that did not reflect the aircraft's true characteristics. At the point at which the dynamic weather process ended, his speed was suddenly ridiculously low, the airplane stalled and went into something like a flat spin. Whether or not the pilots were able to recover from that before reaching the surface is, IMO, an open question. The evidence of a floating emergency exit "door," that would normally be thrown out the window it had been in, the associated over wing escape slide, and the intact, clothed body of a flight attendant would indicate to me that there were people on board who were alive on impact and that an escape was attempted after the aircraft struck the water. On the other hand, bodies have now been recovered still strapped in their seats. My WAG would be that the aircraft broke up in heavy seas before they could get many people out. I am surprised that a few people who survived in life jackets for a while have not been found. Jack Hanson just released the second volume of his science fiction series, Secret Files of the League of Silence. I found this second book entitled “Forlorn Hope” is even better than the first. I read a draft copy several months ago and passed along a few thoughts to the author. I will let some of my comments to him stand for my review. Take a gander at the write up on Amazon. If that doesn’t peak your interest, I don’t know what will. Following the Paris attacks, it quickly became clear to investigators that they had underestimated the one guy who would prove a decisive element in this terror plot. While the Kouachi brothers – who attacked the "Charlie Hebdo" newspaper – had been monitored for a while by French intelligence, Coulibaly – the hostage taker of the Kosher supermarket – was released from jail in March 2014 and disappeared from every radar in April of that year. The investigation into this man's actions during the 8 months prior to the attacks will be crucial to the uncovering of the whole group of conspirators, as well as their potential backers in France and the Middle-East. The veil of mystery that still shrouds these tragic events – i.e. the fact they might be the result of some collusion between Al Qaeda and ISIS affiliated radicals – has not been lifted yet, but the evidence that is slowly trickling in reveals a gradually more consistent and complex picture. On the one hand, it makes no more doubt that the "Charlie Hebdo" attackers had been trained in Yemen. Al Qaeda in the Arab Peninsula has officially endorsed their action, claiming to have both ordered and organised it. Saïd and Cherif Kouachi had travelled to Yemen on at least one occasion and have been in touch with senior AQAP members there. During that time, probably in July or August of 2011, they were assigned the task of attacking "Charlie Hebdo". The Kouachi brothers can therefore be considered a genuine terrorist cell: recruited, trained and tasked with a specific mission, aimed at achieving a certain objective. What remains unclear at this point is whether or not they were in contact with AQAP after their return to France. Given that they knew or assumed to be under surveillance, they had to blend in again into France's social fabric, leading a normal life and avoiding any suspicious activity, and only launched the attack once they were certain they could reach their target. One hypothesis, regarding the timing of events, is that once the order for the attack was given, the Kouachi brothers prepared it and carried it out, independently from any direct connection with the organisation. Nonetheless, it is possible also that they found a way of communicating with AQAP and that a small number of associates, some of whom may already have been arrested, provided the two brothers with the necessary logistics and information. In that regard, it's been known for some time now that Islamic radicals used online gaming platforms in order to communicate and exchange information, or even transfer funds to cells or individuals in various countries. Certain pieces of evidence that was uncovered during a previous investigation into Cherif Kouachi points into such a direction. French police are following up on that lead but it is too early to say whether they are really onto something. The other possible scenario leading to the Paris attacks is much simpler and has Amedy Coulibaly, the terrorist nobody had seen coming, as the primary person of interest. Yemen's Houthi rebels, a well armed Shi'a militia, surrounded the Yemeni Prime Minister's residence yesterday and have now seized the Presidential palace today. This is part of their ongoing attempt to overthrow the goverment, which included last Saturday's kidnapping of the Yemeni President's Chief of Staff Ahmed Awad bin Mubarak. Agence France Presse news wire, picked up by several outlets, has reported that Mubarak was taken because he was working on a revision to how Yemen is politically and teritorially divided - a plan that the Houthis are unhappy with. The continuing sectarian unrest in Yemen, coupled with the activities of al Qaeda in the Arabian Peninsula, presents an additional complexity to concerns over ISIS's interests in Saudi Arabia. Should the events in Yemen lead to a slide back into failing state conditions, or all the way into a failed state, there will be a significant non-governed space that can be used as a transit way, bed down point, and/or training site between the Arab Gulf states, the Arabian Peninsula, and the Horn of Africa. Extremists, terrorists, and criminals will be able to more easily move from the Arabian peninsula into the Horn of Africa and from there into and across the Sahal - both east to west and south to north. Movement in the other direction would also be the case. While there is currently significant differences in the goals, beliefs, and practices of ISIS, AQAP, al Shabaab, and the Boko-Haram movement among the trans-national Fulani, failing/failed states and non-governable spaces along both sides of the Gulf of Aden and the Bab el Mandeb will make it significantly harder to contain the different challenges and threats faced in Africa and Arabia. * Updated to correct missing word in phrase Arab gulf states. "American support for a pair of diplomatic initiatives in Syria underscores the shifting views of how to end the civil war there and the West’s quiet retreat from its demand that the country’s president, Bashar al-Assad, step down immediately. The incomprehensible US policy with regard to Syria has come apart. "The best-laid schemes o' mice an' men gang aft agley, an' lea'e us nought but grief an' pain..."
"The International Criminal Court (ICC or ICCt) is an intergovernmental organization and international tribunal that sits in The Hague in the Netherlands. The ICC has the jurisdiction to prosecute individuals for the international crimes of genocide, crimes against humanity, and war crimes. The ICC is intended to complement existing national judicial systems and it may therefore only exercise its jurisdiction when certain conditions are met, such as when national courts are unwilling or unable to prosecute criminals or when the United Nations Security Council or individual states refer investigations to the Court." Emphasis mine. Important for this post is that ICC jurisdiction is by definition a surrogate for national jurisdiction. The ICC would not allow for a satisfactory protection of rights when compared to US law. The US alleged lack of adequate checks and balances on the powers of ICC prosecutors and judges. The US added that the treaty dilutes the U.N. Security Council's authority over international criminal prosecutions. The US argued that under the treaty US service members and officials could be charged with war crimes as a political move by other nations. The ICC could attempt to assert jurisdiction over US service members, as well as civilians, involved in counter terrorist and other military operations in the war on terrorism. The argument that the ICC would not allow for a satisfactory protection of rights when compared to US law does not appear to hold water. David Scheffer led the US negotiation team at Rome and stressed that during the negotiations the US put great emphasis on the convention meeting the standards of US constitutional tests and expressed confidence at that the US in this succeeded. COL Lang wrote about ISIS's probing attack across Iraq's western border into eastern Saudi Arabia. Since then several interesting commentaries have been posted about what ISIS's target is. One argues that ISIS is planning on taking Mecca. Another that the goal is the oil fields. Both authors are correct, but there is a bigger strategic picture that they are missing. ISIS has three strategic objectives that have to be achieved in Saudi Arabia: 1) take the oil fields, 2) seize Mecca, and 3) weaken or overthrow the monarchy. All three of these objectives are related to Saudi Arabia's human geography combined with several other Saudi socio-cultural dynamics, such as the official religion of Saudi Arabia and the politics of and within the House of Saud. The trap is the result of Saudi Arabia's Shi'a residing in the same place where Saudi oil can be found. Should ISIS make a push to take the oil fields, they will attempt to ethno-religiously cleanse the area of Shi'a at the same time. This is going to place Saudi Arabia in a far more difficult position than just having to protect the oil fields and infrastructure. They will have to defend the Shi'a as well. Remember, the official religion of Saudi Arabia, which is the same religion that undergirds ISIS (and al Qaeda), is intolerant of Shi'a Islam. This commonality of Wahabbi religious belief makes Saudi Arabians the most easy ISIL information target. The Information Operations (IO) campaign, and the messaging that ISIL will utilize, do not have to be explained or enforced in regards to the Saudis - its the same religious message. The only discordant note, of course, may be dealing with the declared caliphate of al Baghdadi. The sameness of the belief system is what will make defense of the Eastern Province difficult. Protecting it will require that Saudi Arabia either protect the Shi'a - in place or as internally displaced Saudis - or ignoring the plight of the Shi'a who have come under ISIS control and focusing solely on the oil infrastructure and reserves. The former provides an opportunity for ISIS to effectively target Saudi Sunnis and try to pull their support away from the Saudi government through a coordinated, theologically rooted information operation decrying the Saudi government and military for protecting apostates. The latter creates external risks for the Saudis. These include problems with its foreign supporters and patrons, such as the US, who will have human right concerns regarding the protection of the Saudi Shi'a or lack thereof. Another, more regional concern, will be in regard to Saudi's regional rival Iran, which has cast itself as the protector of Shi'a. The combination of Saudi's oil infrastructure and its Shi'a in the Eastern Province is going to add a significant complication. While Mecca is a clear ISIS target, the real ISIS objectives are capturing the oil fields and if not taking down the monarchy, then seriously compromising it. Taking the oil fields is important as it allows ISIS to add additional petroleum resources to those they have seized in Iraq. This, in turn, will allow for further sales on the black market bringing ISIS increased revenue to fund its expansion, consolidation, and operations. Capturing the Saudi oil fields would also, essentially, destroy OPEC and the global oil marketplace as we currently know it. Saudi's recent driving of oil prices to under $50.00 a barrel had multiple drivers. One was to make it financially unprofitable to extract oil from tar sands. Once the price of oil goes below $60 to $65 dollars a barrel, tar sands extraction just is not worth it. This motivation, however, quickly gave way last Fall to trying to beggar ISIS. The lower the price of oil on the global market, the less revenue ISIS can bring in selling the oil from the seized Iraqi oil fields on the black market. Should Saudi lose control of its oil, it will lose control over OPEC, which is likely to deal a serious blow to the stability of the global petroleum market. The monarchy is ISIS's other target. It is right now going through a somewhat rough patch. King Abdullah, who is 90, has been recently hospitalized with pneumonia. The succession has been clearly established since 2013. Crown Prince Salman is the immediate heir and Deputy Crown Prince Muqrin is second in line to the throne should something befall King Abdullah. What is interesting here is that Deputy Crown Prince Muqrin is not only the youngest of the Sons of Saud, his mother was also a Yemeni consort/concubine. This has raised some questions, both within and without the Saudi royal family, about his legitimacy. The current line of succession further isolates the remnants of the Sudairi Seven, their sons and grandsons, who had long dominated the politics within the House of Saud. The next succession is also the last one that is solely under control of the king. All future successors after Abdullah's two choices will have to be approved by the Allegiance Council, which is made up of thirty-five senior princes. While the succession has been clearly delineated, the ill health of King Abdullah creates opportunities for ISIS to further their objectives against the Kingdom. ISIS has three different objectives it needs to achieve in Saudi Arabia. The first is taking the oil fields, which will provide ISIS with increased revenue on the black market. It will also be an additional economic weapon in ISIS's arsenal in the attempt to consolidate and expand its caliphate. The second is to drive across the country and seize Mecca. Control of the holiest city of Islam will further enhance ISIS's theocratic and theopolitical messaging, justifications, and IO campaign. Taking Mecca would also create an additional opening to further weaken or bring down the monarchy. Saudi Arabia, specifically the monarchy and the religious authorities, have always been the target of al Qaeda. ISIS, as an al Qaeda offshoot, is partially driven by the same theopolitical calculus: that Islam cannot be returned to the straight path until the House of Saud is removed and the religious authority is purged and replaced with a proper Islamic system of governance, religion, economics, and social control. It is perhaps this reality that shows just the extremism and unreality of the reactionary Islam promoted by al Qaeda and ISIS - the belief that Saudi Arabia is not properly Muslim or not Islamic enough! 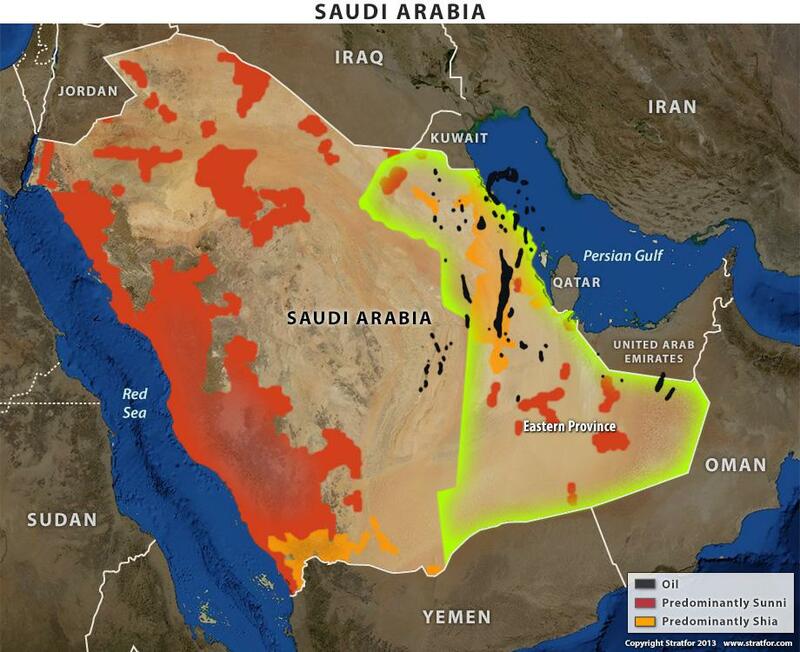 1 I found this map of Saudi demographics, as well as the where the oil fields are, here. The bottom righthand corner of the map, however, indicates that it was created by StratFor. 2 As`ad Abu Khalil's The Battle for Saudi Arabia has one of the best written and documented histories of the creation, development, politics, and religion of the Saudi monarchy. Iraq is now partitioned. Forget it and move on. "Nearly every night for a year, mortar and sniper fire from Islamic State group militants has pinned down outgunned Iraqi troops on the edge of Fallujah. What was once the Sykes-Picot creation called the Kingdom of Iraq is dead. It is finished. That country was established as a European contrivance and convenience in what had always been called the Mesopotamian region centered on the Tigris and Euphrates drainage systems. In what was traditionally called "Iraq," the British, with French political acquiescence, cobbled together a pastiche of very different ethno-religious groups and placed a princeling of the Hashemite family on a newly established throne. Ethnic Arabs, Kurds, Turcomans, and Jews were forced into a "shotgun marriage" that suited none of them. Sunni and Shia Muslims, Yazidi pagans, Jews, and various kinds of Christians were all told that for the first time in history they had become a new kind of human, "Iraqi Man." This collage of the peoples of Mesopotamia and Kurdistan limped along for almost 80 years under a variety of governments. One of the principal functions of these governments was to maintain a coerced "unity" in this artificial state. The endless wars between the Baghdad centered state and Kurdish separatists were emblematic of the festering dissidence that always lay just below the surface of daily life. All this ended when the United States and its coalition of the willing invaded Iraq in 2003 and destroyed the state of Iraq and all the mechanisms of state identity and power. The motivations for this program of destruction of the structure of the state of Iraq, have been and will be endlessly discussed. I am weary of the debate. What matters in January, 2015 is the simple truth that Iraq as it was is no more. IS holds the north and west of the country with the exception of what has become a de facto country in the Kurdish "Autonomous" Region. The Shia Arabs hold the south from their part of Baghdad all the way down to Basra. They are likely to retain control of that territory for the simple reason that the Shia Iranians will not let it be taken from them. In the midst of this new reality, the United States clings to the fantasy of a re-united Iraq. IMO this is a dangerous fantasy, and one which will continue to cost us a great deal of money. More importantly the fantasy has lured us into a position in which we are spreading small groups of our soldiers across parts of Iraq in which Baghdad government control can only be described as tenuous. If we continue to do that some of these soldiers, our soldiers, are going to be captured, killed or maimed in circumstances in which we will be powerless to help them. "... Rice-Sized Laser That Can Boost Quantum Computing"
"... a laser the size of a grain of rice, while investigating the use of semiconductor material fragments as components for quantum computing. The study was started to explore the quantum dots, and not lasers. Quantum dots act like single atoms, as components for quantum computers. The maser is a tiny, rice grain sized laser that is powered by a single electron from the artificial atoms called quantum dots. Jason Petta, an associate professor of physics at Princeton and the lead author of the study, said, “It is basically as small as you can go with these single-electron devices.”"
Last night's raids by Belgian police, and the ensuing shootout in the city of Verviers, bear the hallmarks of a gradual shift in the nature of the Belgian jihadi and radical Islamic scene. While authorities are denying any connections with the Paris attacks, there's enough circumstancial evidence to suggest a more complex picture. Anyone who has ever been to Brussels could easily be fooled by the apparent tranquillity of the Belgian capital. If you had to ask Rummy, a.k.a. Donald Rumsfeld, he would tell you that this is deep "chocolate making country". But looks can be deceiving and Belgium has actually played a major role over the years in the spread of radical Islam and its most violent proponents, as evidenced by last night's events. Belgian Federal Police stormed a building in the small town of Verviers, 70 miles east of Brussels. Just like the previous week in Paris, the suspects came out all guns blazing, before being cut down by Belgian SWAT after a 10 minutes firefight. Two of the men were killed, a third one seriously wounded. Details are slowly emerging about the nature of the plot that was foiled by thursday's police operation. The two men killed - one with a Chechen background whose identity is yet unknown and a certain Souhaib El Abdi from the Molenbeek area of Brussels - had returned from Syria about a week ago. Wiretaps show they had been in contact with a third man, likely to be the leader of this "cell", whom Belgian police believe to be Abdelhamid Abaaoud. Just like El Abdi, Abaaoud is originally from the area of Molenbeek, and had left for Syria to join ISIS. He's no longer fighting there however and is supposedly staying either in Turkey or Greece, from where he was coordinating the plans for the coming attacks. Finally, the man who was wounded and arrested in the Verviers raid, 25 year old Marouane El Bali, is another resident of the Molenbeek suburb of Brussels. His mother and cousin, who had initially also been taken into custody, have now been released. According to several sources, the group had sent threatening letters to stores selling the "Charlie Hebdo" magazine and was planning for the bombing of Brussels' main court and attacks on police officers or police stations. This last piece of information in particular has raised concerns within Brussels' police to an even higher degree, given that several members of this police department had been under investigation for a number of months, on suspicion of having infiltrated the police on behalf of radical islamic groups. In 2010, five years before the events in Paris, nothing seemed to indicate that something big was about to happen. After his release from prison, former Al Qaeda recruiter Djamel Beghal was now living under house arrest, in a godforsaken place in the mountains of Southern France. But he was keeping in touch with his network of friends and associates, both old and new ones, and he was planning for a major operation. His idea was to organize the prison break of a historic figure of radical islam, imprisoned in northern France for his role in a bombing campaign in 1995 that left 8 people dead and 200 injured. Beghal has gathered a genuine "commando unit" of radicals who were willing to storm the penitentiary, escape and then prepare again for a major terror campaign in France. - "newbies" of Jihad, i.e. ex-gangsters, drug dealers and bank robbers who had been radicalised in prison. Amedy Coulibaly, the Paris hostage taker, was among them of course, but also a number of other new converts. Charges were pressed, people went to jail – again – and whatever the plan for the "Big one" was (possibly a large scale cyanide poison attack), it had to be put on the back burner. Not everybody was convicted though. Sherif Kouachi in particular saw his charges dropped, for lack of evidence. Salim Benghalem, the "most wanted" ISIS terrorist, was also spared and soon vanished into thin air, out of reach for French intelligence. Less than a week has passed since the deadly terror attacks in Paris and intelligence agencies in France and around the world are probably still scratching their heads in disbelief, at what might have possibly been the first "joint" attack by a hybrid AQ-ISIS cell in a Western country. Saïd Kouachi (aged 34) and his brother Sherif (aged 32) attacked the French newspaper "Charlie Hebdo" on Wednesday, January 7th, killing 12 people, and claimed right away they were acting in the name of "Al Qaeda in Yemen" (aka AQAP – Al Qaeda in the Arab Peninsula), a local branch of AQ central and long-time home to infamously notorious US cleric Anwar al-Awlaki. Both brothers died in a final shoot-out with French special forces two days later. While the Kouachi brothers started their deadly attacks, one of their associates prepared another wave of attacks and went about his bloody work on Thursday the 8th, one day after the "Charlie Hebdo" attack. Amedy Coulibaly (aged 32) ambushed two police officers in central Paris, killing one and seriously injuring another, before managing to escape and finally deciding to launch a synchronised assault on a Kosher supermarket in Eastern Paris, on Friday the 9th, just as his terrorist buddies were being cornered by French SWAT, a few miles further north. He managed to shoot and kill four Jewish customers as he made his entry into the store, and was finally killed almost at the same time as the Kouachi brothers, as French SWAT stormed the building. In a phone call made during the "siege" he stated very clearly he was acting in the name of ISIS and had pledged allegiance to its "Caliph", Abu Bakr al-Baghdadi. In a video that surfaced on jihadi social media two days after he was shot and killed by police, he reiterated these statements. AQ and ISIS collusion ? Now to some, it may not seem surprising that two jihadi terrorist organisations with the same agenda, similar methods and a common hatred for the West would join forces and try and strike a blow to the "enemy". However, Al Qaeda and ISIS have not been on good terms for a couple of years and have actually never staged a joint terrorist attack in the West. ISIS had started as a local offspring of Al Qaeda in Iraq, and later in Syria, but a rift between leaders of both groups appeared soon afterwards, and the now notorious Abu Bakr al-Baghdadi decided to split from Al Qaeda’s central leadership and start his own thing. We all know what ISIS became in the months and years that followed. Relations between both groups have been tense ever since on the ground in Syria, where they are fighting a common enemy in the person of Syria's Bashar al-Assad, but there have been scuffles and shoot-outs between ISIS militants and Jahbat al-Nusra fighters (Al Qaeda's franchise there), with casualties on both sides. Furthermore, in Iraq itself, it now seems that this is Baghdadi's show only, as ISIS is trying to consolidate the ground it gained there and defend it against the US-led coalition. That is, in brief, the reason why some analysts, experts and intelligence officers must be perplexed at the picture of the two main competitors for leadership in global jihad having possibly staged a joint attack, uniting assets and resources of both organisations in an effort to strike the "Crusaders". But of course, the first question that needs to be asked is about the credibility of any claims made both by the terrorists and the organisations they pledged allegiance to. At the moment, it is obviously impossible to say with any certainty if these claims indeed reflect the truth. But if one looks not only at the statements and videos issued, but also the respective MO of the attackers, the evidence found in their cars and homes, as well as the way in which both ISIS and AQ acknowledged their actions, a picture is starting to emerge that makes this prospect look like a distinct possibility. The fact that police and intelligence agencies in various countries are now also trying to piece together the puzzle of these three men's movements over the years, their connections to other jihadi militants or radical fundamentalist preachers also points to a desperate search not only for the puppet masters who are behind these attacks but an answer to the question that has everyone on their toes: could AQ and ISIS possibly have acted jointly on this one? Details of the current investigation can't be discussed of course, and are obviously beyond the reach of the author of this piece, but looking back at the lives of the three attackers and connecting the dots between them and other jihadis who are well known and well connected to them makes for a very interesting insight into the small world of French, and maybe European or even global islamic terrorism. Going back to how it all began would take us far back into the mid-1990s, back to some unsavoury characters whose names are still known to us today. However, that would over-complicate things for a short piece such as this, so let's focus on the main players and how they turned out to be what they became. After the invasion of Iraq by the US in 2003, a radical cleric in the Paris’s 19th district gathered a small crowd of followers around him and started doing what he does best: indoctrinating disgruntled Muslim youths, feeding their hatred for the West with inflammatory speeches and references to the holy Quran. Soon, an informal network was formed, funnelling money and fighters into Iraq. Sherif Kouachi, one of the two attackers on "Charlie Hebdo", was the leader of this network. Up until then, he had been growing up in foster homes with his brother Saïd, before being moving to Paris and working as a pizza-delivery boy, and occasional petty criminal and thief. But the calls made to help his oppressed brothers in Iraq stirred something inside him. He would never join in on the ground, in Fallujah or elsewhere, leaving it to others to do the fighting, but he would get more and more involved in organising things from France. Several of his associates however, left France and joined Al Qaeda in Iraq, taking part in the battles for Fallujah, some of them ending up as suicide bombers, others coming back maimed for life, but with the aura of a fighter and more determined than ever before to keep on fighting. In 2005, French police managed to put an end to became known as the "Buttes-Chaumont" network, named after the area of Paris in which they come to jog or get together. Seven men, among them Sherif Kouachi were imprisoned and later sentenced for their involvement in this network. Interestingly, the older Kouachi brother ­– Saïd – was not among them, even though he was already known for his radical beliefs. While in prison, Sherif Kouachi continued his indoctrination and radicalisation, the only difference being that now he could get in touch with the "big boys" of radical Islam. He got promoted to the big league of global jihad behind prison bars, which is the sad truth behind the story of many European-born would be jihadis, who get in to jail as small fish in a big pond and get out with a sense of purpose and determination they might not have had before. The man who's going to make all the difference in Sherif Kouachi's life is the Algerian-French Djamel Beghal, then serving time in the same prison for his attempt at blowing up the US embassy in Paris in 2001. The encounter with Beghal is a major step up for Sherif Kouachi. In the 1990s, Beghal has lived in the United Kingdom and has been a frequent visitor to London's Finsbury mosque, home to figures such as the infamous hate preacher Abu Hamza, who was extradited to the US in October 2012 on charges of hostage taking, conspiracy to establish a militant training camp and calling for holy war. Beghal had initially been a member of "Jama'at al-Muslimin" (aka "Takfir-wal-Hijra"), an organisation so radical in its views and actions that even Osama Bin Laden distanced himself from them. But for several years in the 1990s and early 2000s it is believed that Beghal acted as a recruitment agent and organiser of Al Qaeda cells in various European countries. By the time he met Sherif Kouachi in the French prison of Fresnes, in 2005, Beghal had been jailed for 5 years already. He finally got out in 2009, before causing trouble and being incarcerated again in 2010. However, it was in the years 2005 and 2006, while Kouachi was serving his sentence, that Beghal guided him on the path towards global jihad. Interestingly, another of the Paris terrorists was also jailed in the same prison: Amedy Coulibaly, the hostage taker of the Jewish supermarket in Paris. By the mid-2000s, Coulibaly was nothing but a thug, drug dealer and bank robber. He had already been sentenced for several robberies or attempted robberies when he met the other two in the Fresnes prison, and had no background in radical islam. He actually only converted to the "takfiri" brand of Islam during or after another stay in prison, in 2007-2008. But Coulibaly was by no means the only small-time thug that Beghal, Kouachi and his associates from the "Buttes Chaumont" network met in jail. Prison is a small world. And for jihadis in prison, it is an even smaller world... And there was yet another man in that same prison who, just like Coulibaly, was not a radical at that time, but would turn out to be on the US "most wanted" list in 2014: Salim Benghalem, a gang member, sentenced to 10 years for homicide. At the time, in 2005-2006, Benghalem was a nobody in the world of Al Qaeda, and ISIS didn’t even exist back then. But Benghalem shared a cell with a friend of Kouachi, a man who had wedged war on the American "infidels" in Iraq, a man who had taken part in the battle in Fallujah, who was injured three times in combat and who'd lost an eye and an arm on the battlefield. Benghalem, no doubt, looked up to his cell mate and buys into the romanticised "war veteran" stories . . . Once he'd bought into it, there's also Beghal the ideologist, who was going to finish the job, bringing him over to the "Dark side". In this regard, Benghalem and Coulibaly can be seen as two perfect examples of the interaction between jihadi indoctrination of what were originally crooks, thieves bank robbers or gang members ... in short, criminals with no radical pasts, but a "bright" future in Al Qaeda's or ISIS fight against the West. Both these men, Benghalem and Coulibaly, met each other and became friends in prison. Their paths would cross each other several times after and they probably always stayed in touch, ever since jail time. Why is this so crucial ? Benghalem's name may not ring a bell to many, but in the intelligence community, red lights go on as soon as his name is mentioned: in September 2014, the US State Department put him on a list of 10 "Specially Designated Global Terrorists" under Executive Order 13224. In other words, he's one of the 10 most wanted foreign terrorists the US is looking for. Having fled France in 2012 after he was released from jail, now with a strong ideological foundation, after the years spent with Beghal, Kouachi, Coulibaly and co., he went to Syria and joined ISIS, rising to prominence in the terrorist organisation through his accomplishments as fighter, executioner and henchman ... This link between the now-infamous ISIS terrorist, Salim Benghalem, and his then prison buddies Coulibaly and Kouachi may later prove crucial in the explanation and answer to the question about Al Qaeda and ISIS collusion in the Paris attacks. But we've only reached as far as 2010 now and nothing regarding the Paris attacks is in the pipeline at that time. The stage however, has been set for act two in the build-up to last week's tragedy. The main players are now all islamic radicals, ready to move into action, ready for the "adventure" of global jihad. Some of them may still have been in jail in 2010, but soon they would be getting out and starting to plot again, under the leadership of Beghal, the former Al Qaeda recruiter and terrorist cell organiser. Strangely, one central figure of the Paris attacks, Sherif Kouachi's older brother Said, has never been suspected or arrested of anything at that point. He had passed totally under the radar of all the intelligence agencies. But that was going to change soon afterwards, as he too was finally going to cross the Rubicon and meet his "spiritual leader" in Yemen ... a leader no other than Anwar al-Awlaki, the US-born cleric, who preached to three of the 9/11 hijackers, had extensive e-mail exchanges with Fort Hood mass killer, Malik Hasan, and coached Umar Faruk Addulmatallab, the so-called "underwear bomber" who tried to blow up a Northwest Airlines Flight in 2009. "Islamic State group fighters attempting to retake a town in northern Iraqheld by Kurdish peshmerga forces have killed at least 30 Kurds, an Iraqi military spokesman said Sunday. The battle for the town of Gwer demonstrates the Islamic State group's ability to still launch offensives in Iraq, despite a monthslong campaign of airstrikes by a U.S.-led coalition. And while an alliance of Iraqi troops, Kurdish fighters and Sunni and Shiitte militiamen have made some gains, their advance remains tenuous at best. The fighting began Saturday as the extremists approached Gwer, just outside of the northern city of Mosul, which the Islamic State group controls, said Halgurd Hekmat, a spokesman for Iraqi Kurdish forces in Irbil. Hekmat said he had no information about casualties suffered by the Islamic State group. Backed by U.S.-led airstrikes, Kurdish forces retook Gwer in August after the Islamic State group's offensive saw it seize a wide swath of Iraq. Kurdish fighters from Iraq also have deployed in small numbers to help Syrian Kurds battle the group's fighters in the Syrian border town of Kobani. So far as I can see from Google Earth, Gwer is on the western side of the Irbil metro area and about half way to Mosul. Is that right? The interesting thing in this is the continuing ability of IS forces to take ground and hold it in the face of heavily applied coalition air power. There are increasing numbers of US trainers and adviser out in the field with Pesh Merga and Iraqi "Army" units. There are some 300 out at al-Asad air base in western Anbar. It is besieged by IS. "British Prime Minister David Cameron, German Chancellor Angela Merkel, Israeli Prime Minister Benjamin Netanyahu, Palestinian Authority President Mahmoud Abbas and Russian Foreign Minister Sergey Lavrov were among those who attended, along with religious leaders. Fareed Zakaria, host of CNN's "Global Public Square," called the absence of top U.S. officials a mistake. France is the United States' "deepest ideological ally," he said, and it would have been a meaningful image to have a senior administration member, or the President, standing shoulder to shoulder with other leaders. Zakaria said that the WH excuse for their indifference to this event in Paris was "pathetic." I agree. What greater proof of the arrogance of the BHO Administration could we have provided the world? Biden should have neen sent. He would have enjoyed the attention. The Chief Justice could have been sent. Bill Clinton would have jumped at the chance. He would have seen it as an opportunity to hook up with old freinds. He has always wanted to know Angela Merkel. In this year that saw the failure of an Orbital Science cargo launch and the disintegration of the Scaled Composites space plane and with the recent triumph/glitch of the Rosetta lander (did touch down - mind boggling but the harpoons designed to anchor is failed to failure and it landed in shade and could not use it’s solar arrays), I recalled the phrase used by the old engineers (Apollo/Gemini/Mercury/Viking Lander) who I worked with. Space is a hard road. With all the wailing and mourning over the shutdown of the Space Shuttle program, one would have thought that we have entered into the a new and risky world of private companies being given the responsibility for space launches. And, this was a shocking abandonment of responsibility by our government. In fact, a constant of much early science fiction had been privatized space commerce. There was little in the way of assumption that access to space would be controlled by governments, with the exception of military expediency. And space access was, by inference, pretty cheap. "YALTA, Crimea — In the scramble for Crimea’s spoils, armed forces have raided myriad enterprises across the peninsula, expelling the owners and claiming the property for the Crimean government." "Since Russia annexed the Black Sea peninsula 10 months ago, more than $1 billion in real estate and other assets have been stripped from their former owners, according to estimates from the owners and lawyers....Property seizures on such a sweeping scale have not occurred since the Russian Revolution, owners said. Many have argued in court that the confiscations violate a clause in the Russian Constitution mandating compensation when the government takes property. But given the triumphant mood in Moscow about the annexation, the owners expressed little hope for redress." Crimean authorities deny they are confiscating properties; it is a "process of forced compensation." Neil MacFarquhar, NY Times, January 10. "On Jan. 1, the president of Egypt made a stunning speech. Abdel Fattah al-Sisi spoke at Al Azhar, the greatest university in the Arab world, a place of Islamic scholarship dating back more than a millennium. Al-Sisi didn’t just speak to scholars though. He also addressed the Awqaf Ministry, the government’s religious department that funds mosques and Muslim imams across Egypt. Al-Sisi is Egypt’s president and he’s also its top general. And his speech was an order. A plea, but a command as well: Islam needed to reform itself. How was it that the religion they all loved is so hated by the rest of the world? Why is the world so Islamophobic – not in the politically correct meaning of that phrase, but in the literal meaning of that phrase. Why is the world so scared of Islam? Babak. We await your voice. I anticipate your unhappiness with the notion that Islam can be "reformed." Of course you are Shia and the notion of gradual adaptation to a changing world through accumulated fatwas from the senior scholars of the hawza is embedded in your version of the faith. From the point of view of al-Sisi the largest problem is with the much larger Sunni Islamic presence because of the rigidity of the process of non-adaptation to a changing world that has been deeply characteristic of Sunni Islam for a millennium and more. The presence within the Sunni "community" of factions that hold extreme salafist opinions and who are willing to put them into action by force of arms has become a problem for the whole world..
IMO, a Sunni reformation from within religious and governmental institutions like Al-Azhar and the Ministry of Awqaf in Egypt is badly overdue. Many people here at SST are still horrified at the level of destruction wrought upon Iraq, Pakistan, etc. by the United States. As I have written before "you ain't seen nuttin yet." The US was distracted by the false dogma of COIN in these wars, a doctrine easily accepted as a panacea by the ignorant. This doctrine sought an accomodation with local populations through "good works" but carried out in the context of a largely unadaptive world view on the part of the populations involved. Most Americans, while willing to give such efforts a "try," really prefer overwhelming brute force and the complete destrction of enemies. The air campaigns of annhilation that we waged against Germany and Japan were not a fluke. We never really applied that level of force in the recent wars. The possibilities available are virtually unlimited. Al-Sisi sees the danger. His call for attitudinal reform is an attempt to save his people, the Muslim people across the world. He should be listened to. Events in France point to future degeneration of the situation of the Muslims that should give them all pause. Al-Sisi went to Mass on Christmas as a symbol of his acceptance of the Copts as fellow Egyptians.
" The F.B.I. and Justice Department prosecutors have recommended bringing felony charges against David H. Petraeus, contending that he provided classified information to a lover while he was director of the C.I.A., officials said, leaving Attorney General Eric H. Holder Jr. to decide whether to seek an indictment that could send the pre-eminent military officer of his generation to prison. The Justice Department investigation stems from an affair Mr. Petraeus had with Paula Broadwell, an Army Reserve officer who was writing his biography, and focuses on whether he gave her access to his C.I.A. email account and other highly classified information. F.B.I. agents discovered classified documents on her computer after Mr. Petraeus resigned from the C.I.A. in 2012 when the affair became public. David Petraeus is a retired officer (still in the Army) and should be referred to by his rank and not as "Mr Petraeus." If this happens he would be better off IMO to be recalled to active duty and court-martialed. The US Army would be required, IMO, to provide him with defense counsel. I think that would not be the case in a federal civilian court. This article completely grabbed my attention. I am an amatuer futurist, a long time reader of science fiction and managed to earn a minor in ecological science (emphasis on bio-systems). What struck me is the creeping nature of discovering (the possibility turning into fact) that we have evidence of microbial life on Mars in the past eons. There was a famous ‘false positive’ during the Viking Lander era, the continuous discovery of spikes of methane (often related to microbial action on Earth) and various formations of mineral formation and deposit that, on Earth, occur in the presence of warm water. Yet rigorous science always demands that an observation is repeatable and other reasonable explanations have been ruled out. That is obviously harder to do in the setting of studying these things on Mars. The rate of failure of probes to the Red Planet is high. The current advanced rover, Opportunity, took a impressive feat of engineering and program management to land a golf cart sized machine on the surface. So, when a scientist says that a rock formation on Mars resembles the same pattern of fossils back on Earth, what references can we go to to understand how this more than likely billion year old formation near Opportunity is, in fact, an artifact produced by ancient life, the first to be discovered off our own planet? We can go to Wiki to get a reference to a remarkable process that is probably 3.9 billion years old and can still be seen working today. It’s called stromatolite formation. The pictures in Wiki show both ancient fossilized stroma and current ones forming in Australia. The microbial mats mentioned are the same mechanism that Nora Noffke is proposing as the agent in creating the fossil presentation she detects in the Opportunity pictures. If we can verify this as highly probable, we will have crossed the ‘life can only form on Earth’ threshold. As our science is busy looking for exoplanets in the ‘Goldilocks Zone’ (most favorable orbits for the formation of earth like life in other solar systems), we get to confront the questions to our view of our place in the universe. What will the anti-Darwinists say, other than denial, in the face of reason, when some future astronaut/scientist looks into an electron microscope and declares that a formation on Mars was in fact created by microbes, perhaps a billion years ago? For myself, if I am alive to hear and see that, it will be perhaps the most profound moment of my life. BTW, what is this beast? My story was simply a story, a memory, an offering made in good faith, not a piece of strutting or egoistical self-display. When I was a very little boy I never heard a radio and the advent of TV was years off. I grew up in deep woods. Solitude is the perfect food for the young, solitary soul. I was intensely interested in what I heard and observed. My interests were entirely local. But I made great efforts to remember them and began a kind of mental journal. But when you are little kid, the figures of authority were viewed more in terms of the penalties they could bring rather than offering something to emulate. I simply knew that as a boy, that parents were to be feared and teachers were to be feared too. Unfortunately, fear suffocates thought. What are we to be? That’s the chief question that a young person ponders. What are we to be? Little by little, figures jut up in our lives that we respect because of their talents, their more penetrating minds or their superior kindness. At a young age, we have no idea of what a “great” man is, much less the causes that act to create a “great” name. Every young person is always trying to fashion trials and tests that determine the range of their talents, their abilities, their ideals, their true inclinations and propensities. We do this by observing and noting, and we specially note failures. Drastic failures discourage new, improved attempts. But in our young lives, there are people who seem to embody everything that are strong, graceful and intelligent, and such people seem to display great extensiveness of ability, and on that account are widely admired by others. Our admiration is conditioned by the respect we feel for certain superiors. One of the reasons they loom so large is that a young person lacks any developed or reliable sense of prospective, so looming ideals of an earlier day begin to shrink in size, and new admirations replace the older ones. "One of the two brothers suspected of gunning down 12 people in an attack on a Paris-based satirical magazine traveled to Yemen in 2011, where he was in touch with Al Qaeda training camp leaders and may have had contact with key leaders of the terrorist group including a bomb maker and a former Guantanamo Bay detainee, U.S. officials told Fox News. Both Said Kouachi, 34, who is known to have gone to Yemen, and his brother, Cherif Kouachi, who served time in France on a terrorism conviction, were on a U.S. no-fly list, sources said. The new information appeared to corroborate the suspects, who were still being hunted Thursday night, had ties to Al Qaeda's Arabian Peninsula affiliate (AQAP). Investigators are trying to determine if Wednesday's attack was directed from elsewhere, or an attack conceived and carried out by the brothers. Before we start, a brief Public Service Announcement: The odds of an American being killed in a terrorist attack is 1 in 3.5 million per year!!!!!! As has been widely covered just about everywhere, several gunmen attacked the office of a French satirical publication early today. I highly recommend the BBC's, or really any news service's coverage other than the usual American media outlets, to get appropriate, non-hysterical, non-fearmongering coverage. As we see all too often when something happens in the US, our media goes into immediate freak out mode. While this may make for good revenue through advertisement sales, it really does not do much to inform Americans. Several days ago in his post on James Fallow's recent article, COL Lang remarked about how easily Americans became fearful after 9-11 and how we have remained that way. We have seen that on display today by think tank fellows (h/t SteveM), retired general officers (h/t Zandar), and sitting members of the House (h/t Zandar) and the Senate (h/t Charles Pierce). Today's media coverage, the informed commentary that it contains, and American reactions will follow the same pattern that both COL Lang and Mr. Fallows lamented - more fear driving more poorly thought out policy responses. It is important to remember that the odds of an American being killed in a terrorist attack is 1 in 3.5 million per year!!!!!! Not that a little thing like facts or reality are likely to make any difference. Finally, before the usual suspects get completely into the swing of things by claiming that Muslims never condemn other Muslims who commit terrorism or who claim their actions are somehow covered under Islam, here's the initial google search result for Muslim, and some Arab, organizations that have already condemned the attacks, even though we are still not sure, other than a witness statement of a screamed "Allahu Akbar" during the attack, who is actually responsible. "Paris prosecutor Francois Molins said the assailants killed a man at the entrance of the building to force entry. They then headed to the second floor and opened fire on an editorial meeting attended by eight journalists, a policeman tasked with protecting the magazine’s editorial director and a guest. “What we saw was a massacre. Many of the victims had been executed, most of them with wounds to the head and chest,” Patrick Hertgen, an emergencies services medic called out to treat the injured, told Reuters. A Reuters reporter saw groups of armed policeman patrolling around department stores in the shopping district and there was an armed gendarme presence outside the Arc de Triomphe. 1- They tried to go in the wrong door. This indicates that the planner of the attack was not in the strike group. The assault party would normally have been walked by the door one at a time in the preceding days in a really well run op. 2- Once they arrived at the right door, they had to ask a janitor or someone else like that where the conference room was located. 3- They evidently had a rocket launcher with them (RPG-7?). This would have been for breaching the door to get in. That would indicate that they did not really know much about the security in the building. 4- They should have had a car available to switch to in their escape butthey did not. Instead they hijacked a car from an elderly Frenchman. He asked if he could have his dog from inside the car. They complied with his request. On the positive side from the raiders' POV, they knew who to expect to find in the building. They called them out by name before shooting them and they timed the attack to have maximum access to important targets. "Charlie Hebdo" evidently chose not to harden their doorway. It would have been easy to do. The French Police gave chase immediately and several fire fights ensued in the immediate area and across the northern part of the city. IMO it will not take long to find them in whatever safe house they are lurking. They will then have the chance to "dance" with the CRS and a Gendarmerie Group d'Intervention. "For the first time since the Islamic State group formally announced its desire to conquer Saudi Arabia last month, government officials said terrorist elements had launched an attack on the Saudi border with Iraq. Four militants, one wearing a suicide vest, attacked a border fortification Monday, killing three Saudi border guards. Meanwhile .... Rear Admiral John Kirby, the DoD press spokesman is assuring the world that the assistance efforts of the US & friends have stopped the rot in Iraq and Syria and that IS has lost the initiative to us. I doubt it. It seems more likely to me that what damage we have done to IS with air attacks is not decisive. What I hear from within DoD and CIA is that the temptation to get rid of independent thinkers among the analysts and hire yes men (and women) in their stead has prevailed so that the decision makers are once again being told what they want to hear by members of the time serving and careerist members of the boot licking class. Based on the much welcomed assesments of such people the US is preparing to deliver another 170 odd Abrams tanks, masses of armored Humvees, a lot of MRAPS and a mountain of small arms. IMO, IS will welcome the renewed supply of equipment. "Israel's military advocate general, Danny Efroni, is seen as the leader of the drive to investigate soldiers. Efroni and his legal team have received more than 100 complaints regarding incidents from last summer's war and plan to conduct criminal investigations into at least 10, including the deaths of four boys in an explosion on a Gaza beach on July 16 and an attack on a UN school on July 24. Efroni's perspective, military analysts say, views an internal investigation as preferable to a potential probe by the International Criminal Court. The military did not answer a request seeking comment. The Palestinians are expected to join the court within about 60 days. Once that happens, they can submit war crimes claims against Israel. However, if Israel can show the court that it has carried out its own investigation in good faith, it could avoid an outside probe. "Some in the military say 'let us investigate, we have nothing to hide. The moment we investigate, international law won't intrude. There will be no international inquiry and no trial in The Hague,"' said Ilan Katz, a former military deputy advocate general. Well, you can have an army that knows it is individually and personally responsible for its actions or failure to act or you can have an army that feels that it can act with impunity. If the latter, then you will see killing of PWs after their surrender has been accepted, abuse of civilians, disproportionate use of munitions like White Phosphorus against civilian targets , etc. There are many here who think that any violence is a war crime. That is not a real world position but the habitual use of massive force against tribal enemies in the Israeli way is also not a sustainable real world position either. "Studies have shown that up to a quarter of the river’s brown bullheads, a type of catfish that feeds on the toxin-clogged sediment at the bottom of the Anacostia, have skin tumors, and as many as half have liver tumors. "S--t Creek" is the local nickname for this stream. The Anacostia River should have been cleaned up long ago. Inaction in this matter is a monument to the collossal ineptitude of the autonomous District of Columbia government, a government plagued by federal graft investigations and an obvious inability to govern effectively. The high end estimated cost for cleaning up this welter of sewage and industrial pollution is $500 million. Let's think about that number in the context of what we have been throwing away in the Forever Wars. The Potomac River into which the Anacostia flows has been greatly improved in water quality in the last fifty years. Fishing in the Potomac is now a normal activity as is the presence of a lot of waterfowl. The City of Alexandria, Virginia, ten miles from Washington, DC has a population of 140,000. I am an Alexandrian. We recently finished construction of a new version of TC Williams High School. That cost the city around $150 million. There are numerous other projects recently done or underway around town; the African American cultural center, etc. When you add them all together the numbers involved will closely resemble the estimated costs of an Anacostia River clean up. We meet our obligations in Alexandria. "Jewish settlers attacked American consular officials Friday during a visit the officials made to the West Bank as part of an investigation into claims of damage to Palestinian agricultural property, Israeli police and Palestinian witnesses say. The incident is likely to further chill relations between Israel and the United States, already tense over American criticisms of Israeli settlement construction in the West Bank and east Jerusalem, and Israeli perceptions that President Barack Obama is only lukewarm in his support of Israeli diplomatic and security policies. You do notice that the MSM in the US has largely ignored this attack on US consular officials? You do notice that, don't you? This criminal attack is under investigation by Israel's police. Good, is it also under investigation by US Diplomatic Security and/or the FBI? No? What a surprise it would be if the WH and State Department are looking the other way! This is yet another instance of the "Mouse that Roared" phenomenon in which Israel tries (often successfully) to control US behavior. I have had little regard for the character of the American “people" since VN. Their spiritual abandonment of the US armed forces in Vietnam in a war to which they had been sent by the elected US government was a powerful lesson with regard to the fecklessness of "the people." My opinion was confirmed after 9/11 when the cowardice of most American civilians was evident to all, except perhaps to them. The blind fear observable in their faces and behavior was disgusting. This pervasive and pathetic fear led them to accept, indeed to revel in, such abominations as the torture regime in foreign prisons, the TV series, "24" with its moden Torquemada, and The Patriot Act which stripped free men of many of their liberties. And let us not forget how lustily most of "the people"cheered at first for a mindless war in Iraq, a war that has wrecked stability in the ME and which has brought forth such fruits as IS.